Castle celebrate with the Senior Cup. Pic by Pat CashmanFormer GAA All-Star Conor Deegan picked up his fourth All Ireland medal when he helped Dublin club Castle claim its first Chartis sponsored Irish Senior Cup pennant with a 3-2 win over Warrenpoint at Kinsale. 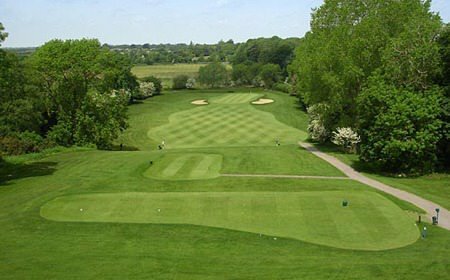 His 2 and 1 win over David Barron levelled a thrilling decider that went to the final green of the final match with Daniel Holland clinching Castle’s first Senior Cup in the club’s 99-year history with a two-hole win over Ryan Gribben. Conor Deegan (Castle) missing a putt on the 11th green in the Chartis Europe Senior Cup at the All Ireland Cups and Shields at Kinsale Golf Club 22/09/2012. Picture by Pat Cashman“To say I’m ecstatic is not even close,” said former full back Deegan, who won a Minor and two Senior All Ireland titles with Down in the 1990s. 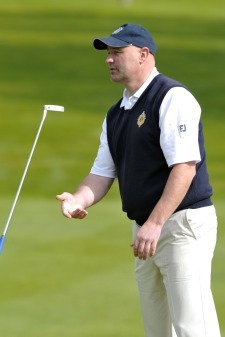 One up playing the last, 21-year old Holland hit an 80-yard wedge to six feet and was eventually conceded the hole and the match for his ninth win from nine in Castle’s campaign. “I had a feeling it was going to come down to me, I really did. There’s no way that matches are won straight out one, two, three in Senior Cup finals, it never happens. I knew I had to be ready for it. 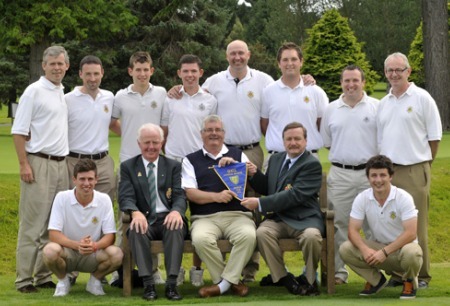 While it was a disappointing day for Warrenpoint, Tyrone club Killymoon gave Ulster golf something to cheer about with 3-2 win over Roscommon on the Jimmy Bruen Shield final. 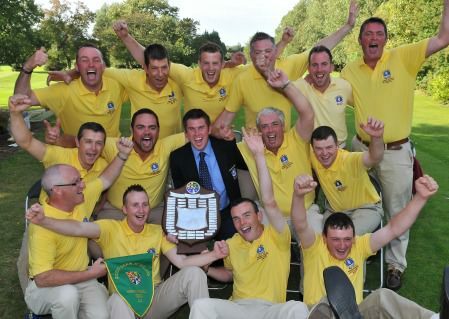 Killymoon celebrate their Jimmy Bruen Shield win. Pic Pat CashmanKillymoon’s playing captain Brian Gogarty said: “This is the first time we ever had any sort of glory or victory ever at the club. “I’ve captained the team for the past three years and the last two years we didn’t even qualify so we qualified big time this year, by 15 shots from the second place team. Club President, Tom Doonan, played on the team, and with an age spread of over 50 years, there was a good mix of youth and experience. D Holland bt R Gribben 2H. Kevin McIntyre presents Paschal Taggart with the Chartis Insurance sponsored 2012 Senior Cup pennant after their victory over Portmarnock at Hermitage. Front (L-R) Alex Gleeson, Fintan Buckley (President, GUI), Daniel Holland. Back (L-R) Jim Pender, James Hamby, Jack Walsh, Peter McKeever, Conor Deegan, Ronan Burke, Jim Mulready and Harry Gleeson. Picture by Pat CashmanTeenagers Alex Gleeson, Jack Walsh and Dan Holland all won their matches to give Castle a 3-2 win over All Ireland champions Portmarnock at Hermitage and the first Senior Cup pennant in the club’s 99-year history. 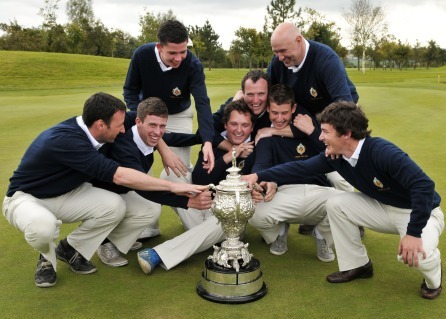 Donaghadee celebrate their historic Junior Cup win at Kinsale. Pciture by Pat CashmanInspiration comes in many forms, but for the Donaghadee Junior Cup team it was in the form of two of Ulster’s brightest golfing talents as the north Down club triumphed at the Chartis Europe sponsored Cups and Shields in Kinsale, writes the Golfing Union of Ireland.